Alastair has been gifted with a complete lack of empathy and kindness. He leads his mercenaries with ruthless efficiency, deeming any loss of men that doesn’t significantly reduce his fighting force’s strength an acceptable loss. Interestingly, he has a sense of morality; those he deems too weak to fight are not worthy opponents, and he will instead strive to protect these weaklings if it means he may find worthy opponents as a result. Oftentimes, the most heartless and ruthless enemies (Alastair’s favourite) will endeavour to slay as many innocents as possible to spread fear and terror, and any warrior who slays those who seek to slay for the sake of terror is a far greater terror. Such goes Alastair’s logic, and he intends to make a name for himself using it. Alastair switches between wielding a single greatsword and two broadswords. 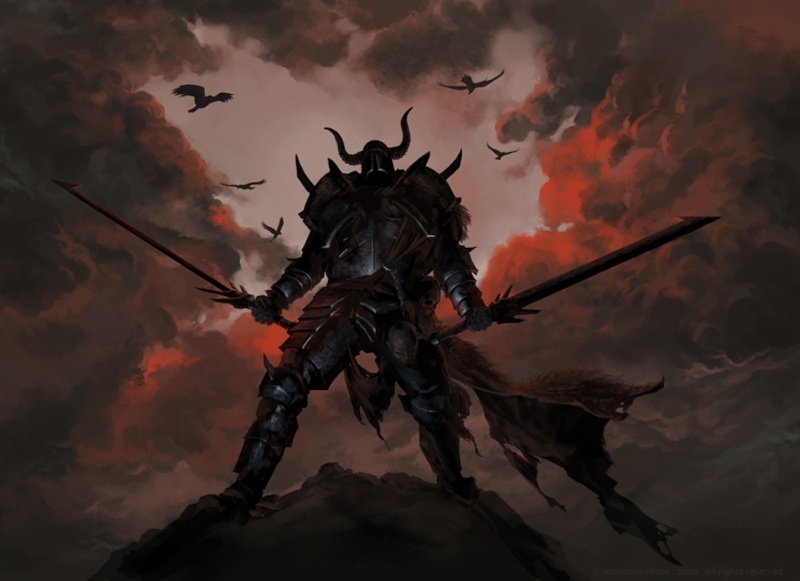 He does not use shields, as he instead relies on his superior swordwork and sturdy, black armour to avoid harm. Alastair’s cold-hearted nature has left him able to chill down metals with ease. He can use this to severely weaken enemy weapons so he may shatter them with his own.